SGMUN Conference 2018 | prisma | echt. studentisch. 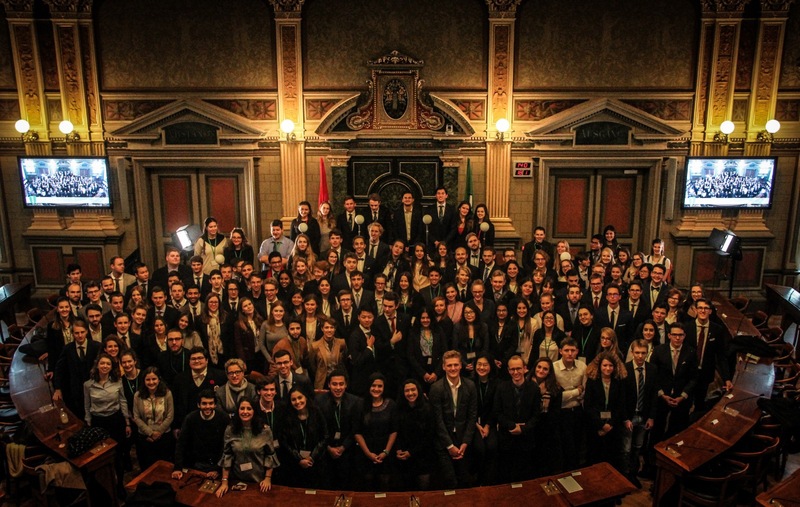 The second edition of the St. Gallen Model United Nations Conference was an amazing success, being ranked in the Top 10 of conferences with 4.6 out of 5 stars. 150 participants from 35 different countries were welcomed to St. Gallen, taking part in four days of rigorous debate in six different committees. Model United Nations simulates the variety of work done in the United Nations and aims to provide students with an introduction to the world of international politics and diplomacy. It offers them the unique opportunity of attending multiple conferences, taking up the role of a UN ambassador and representing the interests of a given country in a committee of the UN. At this year’s conference in St. Gallen delegates debated about compelling and relevant topics such as how governments should include and adapt to the gig economy, in the economic and social council (ECOSOC), or if there should be an international response to cyber-warfare by non-state actors, in the Disarmament and Security Committee (DISEC). The delegates representing different countries all got engaged in the debates and presented a set of new and innovative solutions to their topics by discussing the issues as well as drafting resolutions. Despite the fact that all participants were university students, the debates got really heated. From delegates raising their placards to be added to the general speakers list (only when it is their turn on the list delegates can speak), to motioning for moderated or unmoderated caucuses (discussions about specific topics, either moderated by the chairs or not), sending diplomatic notes to their follow delegates to find a common strategy, creating memes, … in the end, all committees passed at least one resolution. The end of a hard day’s work means it’s time to party. At the evening socials our guests from all over the world met up to experience authentic Swiss fondue, play drinking games and go to one of our St. Gallen clubs. Thanks to our band and DJ everybody found themselves dancing and enjoying their well-deserved evenings.